Two more manly bedtime stories tonight, since my boys picked them out -- but I highly recommend both of them! This is the story of how young Zeus, with a little help from six monsters, five Greek gods, an enchanted she-goat, and his mother, became god of gods, master of lightning and thunder, and ruler over all. in doing so, he learned a lot about family. Who knew that having relatives could be so complicated, even for a god? My boys LOVED this: fathers eating children, lightening bolts, the Cyclopes -- I expect a mythically-themed play time tomorrow afternoon. I hope this author has more Greek Gods in the works for picture books! In a dusty township in South Africa, Ajani and his friends have earned a brand-new, federation-size soccer ball. They kick. They dribble. They run. They score. These clever boys are football champions! But when a crew of bullies tries to steal their ball, will Ajani and his friends be able to beat them at their own game? On the heels of the recently completed World Cup, this was a perfect South African soccer tale. Enjoy reading to your little darlings! Count Neil Pasricha as another successful blogger crossover to published author. He has taken his blog 1000awesomethings.com to the Mecca of bloggerdom – a book deal. This really isn’t a book review, because honestly, I didn’t read the WHOLE book, I just skimmed the title of each of the author’s “awesome” entries, and chuckled at the ones I liked, and moved on when they didn’t really apply. I do recommend however, if you are skimming it like I did, reading the LAST entry entitled, "Remember how lucky we are to be here right now!" It's wonderful and will brighten your day! His “awesome” entries got me wondering – what would your book of awesome include? That change of season between summer and fall when neither the air conditioner nor furnace need to be on. When I can open every window and have that autumn breeze blow blissfully through my house. (I can’t do it in the spring, because my house would be covered in a haze of green sludge on every horizontal surface). When down to the last sliver of soap, being able to unwrap or unbox a brand new bar! When shelving my books at the library, just when I think I’ve seen them all (hardly! ), I come across one, pull it off the shelf, and start reading (or looking at pictures) and then realize I’ve been standing there for 10 minutes mesmerized. (That happened to me today – and the book was The Lost Lady of the Amazon, just in case you were wondering). What would be on your AWESOME list? Please, read The Cellist -- it will take you one afternoon at the most -- I'm still reliving the story and characters. I just can't shake them. Lisa Shannon had a good life — a successful business, a fiancé, a home, and security. Then one day in 2005, an episode of Oprah changed her life. The show focused on women in Congo, a place known as the worse place on earth to be a woman. She was suddenly awakened to the atrocities there — millions dead, women being raped, children dying in shocking numbers. It was then that Lisa realized she had to do something — and she did. A Thousand Sisters is Lisa Shannon’s inspiring memoir. She shares her story of how she raised money to sponsor Congolese women beginning with one solo 30-mile run and then founded a national organization, Run for Congo Women. The book chronicles her journeys to the Congo, meeting the sponsored women and hearing their stories. Along the way Lisa is forced to confront herself and learns lessons of survival, fear, gratitude, and love from the women of Africa. A Thousand Sisters is a deeply moving call to action for each person to find in them the thing that brings meaning to a wounded world. The horrors inflicted upon women never cease to unnerve me, but I don't seem to do anything about it. Lisa Shannon does. Also, if you haven't read Left To Tell by Immaculee Ilibagiza, I highly recommend it. In 1957, at the age of 16, Melba Pattillo became a civil rights warrior. Following the landmark 1954 Supreme Court ruling, Melba was one of nine teenagers chosen to integrate Little Rock's Central High School. Here, in a special abridged young reader's edition, is Melba Pattillo Beals's remarkable story. It's embarrassing to think that as an adopted Arkansan, I haven't yet read this book. Now I hope to change my ways. So, due to my never ending influx of library books and book buys, I can't seem to make a dent in my TBR list, but I did read two books from my previous post, so that is progress!! 23 comments: Labels: Monday -- What are you reading? I read about 25 pages of this book and knew I couldn't manage another. Do you ever pick up something and realize you just aren't "in the mood?" Well, this was one of those mood books. After recently finishing Nine Parts of Desire, I am saturated with information about Muslim garment requirements -- hajibs, burkhas, etc. -- that I couldn't read another book this soon that details those rituals. I know that this books is MORE than that, but I will need some time and space before I attempt this one again (if ever). 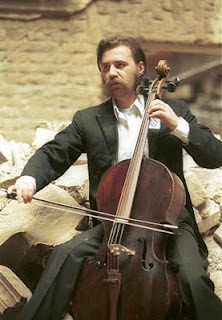 A cellist; an act of defiance and of hope; three lives devastated by war and their ability to survive at all costs. On May 27, 1992 a mortar shell struck a market during the Siege of Sarajevo, killing 22 people, injuring many others, who were simply waiting in line for a loaf of bread. As a sign of humanity and resistance, Vedran Smailović, a renowned Sarajevan cellist, played Albinoni’s Adagio in G Minor for 22 days in the same bombed-out market square, to honor each of his fellow citizens. In author Steven Galloway’s fictional account of the cellist and the siege, humanity is brought to the basic level of survival. Told through the eyes of 3 citizens – Arrow, a sniper; Dragan, a baker and Kenan, a father – the daily necessities of food, water and endurance are told in a bleak but astounding narrative. Simply walking in the streets of Sarajevo was life threatening. Snipers sat in the hillsides taking aim at their targets as if they were ducks in a carnival attraction. What separated those who made it across bridges or streets to the safety of a nearby building was nothing more than luck or chance. This novel was brilliant and poetic. The pallor of war settled on me while I was reading this book. I had to look at the window on occasion to make sure mortar shells weren’t dropping in my driveway. I only wish there had been a map of the city – the topography of Sarajevo – mountains, hills, valley, rivers – was as much a character of this novel as were the actual humans – that it would have been nice to have something in the front of the book to refer to while reading. But that is a minor complaint. I read this in one afternoon. It was haunting. Enough said. Another Wednesday, another night I'm left alone to read picture books to the kiddos. What's a boy to do when his mom buys him everything he wants? Should he take his new toys everywhere? Is the spirit of Dr. Seuss's Green Eggs and Ham or There Was an Old Lady Who Swallowed a Fly, this little boy takes his red hat and everything else with him wherever he goes. 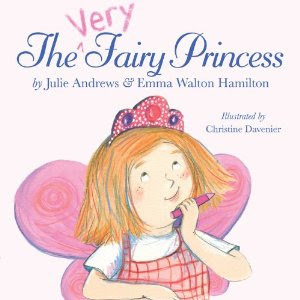 My Princess wasn't home tonight, and her brothers picked this to read anyway...I thought it was precious, and the boys liked it too! Rennie’s home town of Ellis, Colorado is changed overnight when the government decides to build and internment camp for Japanese-Americans evacuees after the bombing of Pearl Harbor. Determined to do what is right, in spite of what many of their fellow neighbors believe, Rennie and her family employee several of the boys to help work their beet crop and a young woman to help with chores around the house. After a neighbor is found murdered, many of the local residents are convinced that the perpetrator is an evacuee – but with little or no proof. With tension running high in town and families being torn apart by war, Rennie often wonders if life in Ellis will ever be the same. Tallgrass by Sandra Dallas started out like the perfect coming of age tale – Rennie (at 13) had a clear, true voice of an adolescent stuck between childhood and adulthood. Her perspective on the internment camp and the refugees was innocent but with the knowledge that, things could get worse, especially if local boys started dying while fighting the Japanese overseas, including her brother. This book never got off the ground for me. What seemed like an interesting premise – never developed. The author, in her foreword, admits that as a non-Japanese, it would have been presumptuous of her to write from the Japanese point of view (take that Kathryn Stockett!). But honestly, that’s the story I would have preferred to read. It would have been far more interesting to read about what went on in the internment camp then what happened on the farm. Also, there were several story lines; it was as if the author couldn’t decide what type of novel to write: historical fiction, murder mystery, quilting-genre fiction, or coming of age novel. And with the exception of Rennie and her Dad, nearly all the characters and their dialogue were flat. I never felt one single emotion that that author was trying to evoke from the page. In one scene, the Strouds learn the fate of their son, Buddy. In what should have been a gut wrenching reaction from the reader, just died on the page. Also, and this is silly and minor – but Rennie’s older sister’s name is: Marthalice. Now – how did you read that? If you were like me, for the first dozen pages I read it: Martha Lice – and I thought – who on earth would use a name like that for a character? Because we’ve had lice in our family and they are evil! It didn’t occur to me until later that her name was: Martha Alice. Doh?! But it bugged me throughout the book. So, this didn’t do anything for me. I still have Hotel on the Corner of Bitter and Sweet on my bookshelf as a contribution to Japanese Internment Camp historical fiction – I hope it is more successful. 13 comments: Labels: Monday -- What are you reading? I hit the used book sale this morning, and although I didn't get nearly as many as I had on my list, I did get a few to add to my ever growing stack of never before read books. Readers will be transported to the vibrant art scene of late nineteenth-century Paris in this richly textured portrait of the relationship between Mary Cassatt and her sister Lydia. Beginning in the autumn of 1878, Lydia Cassatt Reading the Morning Paper dreams its way into the intimate world of Cassatt's older sibling. Told in the reflective, lyrical voice of Lydia, who is dying of Bright's disease, the novel opens a window onto the extraordinary age in which these sisters lived, painting its sweeping narrative canvas with fascinating real-life figures that include Pierre-Auguste Renoir and Edgar Degas, Cassatt's brilliant, subversive mentor. Featuring five full-color plates of Cassatt's paintings, this is a moving and illuminating exploration of the illusive nature of art and desire, memory and mortality, romantic and familial love. I have since been a huge Mary Cassatt fan, and one day, when there is a CNN headline announcing that this priceless work of art is missing, don't come looking for me! There is something altogether haunting here. Perhaps it's the way the story advances, peeling its way from layer to layer until the truth of each character lies bare. Perhaps it's the way Lee shows us that war can make monsters of us all. Most memorably, however, it's her portrait of Hong Kong, which having witnessed so much cupidity, moves on with splendid indifference. Like a piano under different fingers. Or a siren with another song. Leah from Amused by Books gushed about this not too long ago, especially when I was going thru my reading rut of bad books. If nothing else, the cover is pretty! Cassandra Mortmain is 17. Her journal describes the weird and wonderful world in which she lives: housed in a crumbling castle, with her writer father (who is “blocked”), her beautiful older sister Rose, her brainy younger brother and her unconventional artist stepmother, Topaz. The sudden arrival of two handsome American strangers is the catalyst for this touching coming-of-age tale, which sees Cassandra taking her first forays in womanhood not without her fair share of grief and giggles. This is currently on my TBR stack from the library, but for $2, now I will never have to worry about returning it. …a picaresque, swashbuckling adventure, each chapter charmingly illustrated by Gary Gianni…Chabon's highfalutin writing is an object lesson in style perfectly matched to genre…If any good adventure is all about the journey, there is also, as Amram remarks, "an appeal in the idea of seeing some business through from start to finish." And the lark Chabon has in getting there translates into a hoot for the reader. Still, such an arch, lickety-split odyssey won't be everyone's cuppa. The pulp-averse, the history-challenged, the Khazar-illiterate might feel at a disadvantage without a glossary of 10th-century terms. Not every reader will be willing to take all this on literary faith. Nevertheless, if you stick with this tale, you'll be rewarded with a slalom course's worth of twists, not to mention a suitable moral. I think since I am on an Ayelet Waldman kick, my husband is going to do a literary tango with me while reading her husband. Who needs a ladder when you've got a giraffe with an extending neck? The Ladderless Window-Cleaning Company certainly doesn't. They don't need a pail, either, because they have a pelican with a bucket-sized beak. With a monkey to do the washing and Billy as their manager, this business is destined for success. Just when I thought I had heard of ALL the Roald Dahl books, I find this surprise! So, for $10 and 5 books, I think I deserve the bargain shopper of the day award! This was a delightful, romantic, and breezy novel. Perfect for summer. Nine Parts of Desire by Geraldine Brooks. I haven't reviewed this one yet and will wait until after book group, so I can incorporate some of my fellow groupies' thoughts. But my initial thoughts: I was really disappointed. I'll leave it at that for now. Phoebe Swift, the proprietress of a new vintage clothing boutique, forms the center of this richly layered novel filled with the luxurious fashions of a bygone era. As Phoebe discovers, when you buy a piece of vintage clothing, you’re also buying a piece of someone’s past. There’s one item in particular that will unexpectedly change her life. 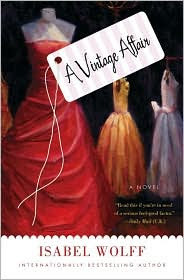 Seamlessly blending humor and heartbreak, A Vintage Affair is a great summer read. This was a "Barnes & Noble Recommends" book selection and I was totally suckered in by the promo. I've read other BN recommended books with varying success. I'm hoping it is worth the "recommendation." BACKSEAT SAINTS will dazzle readers with a fresh and heartwrenching portrayal of the lengths a mother will go to right the wrongs she's created, and how far a daughter will go to escape the demands of forgiveness. 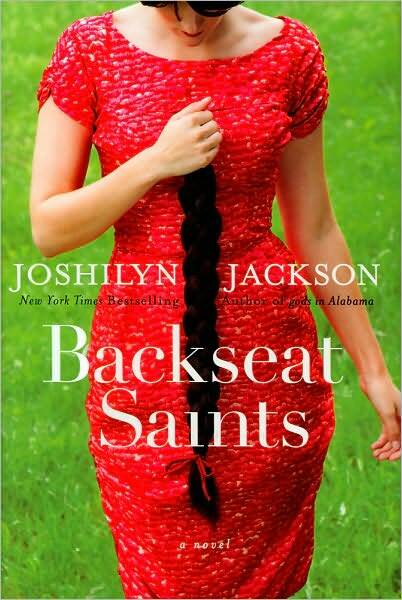 With the seed of a minor character from her popular best-seller, GODS IN ALABAMA, Jackson has built a whole new story full of her trademark sly wit, endearingly off-kilter characters, and utterly riveting plottwists. I will pick this up on Tuesday. What should I start this week? Any votes? I didn't think I was a big biography/memoir reader, I was surprised at what I came up with! Another one I would have added, but it's not really a memoir or biography is The Johnstown Flood by David McCollough. A fascinating book -- I highly recommend it. 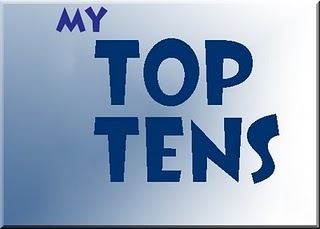 Do you have a top 10 list? Are you a big memoir/biography reader? When I started the third installment of Rick Riordan’s Percy Jackson & the Olympians: The Titan’s Curse – I really didn’t want to like it. I read and reviewed the first two and you may remember that I was hung up over the similarities to the Harry Potter series. The characters, the situations, even the games that they play (I still enjoyed the Quidditch matches of HP over Capture the Flag and/or Chariot Races of PJ). But then I was talking to another father about the two series and he is a HUGH Percy fan and said that Harry was “just o.k”. JUST O.K.???? I almost fell over. I bit my tongue and allowed him to explain. He felt that while the Potter books were extremely entertaining, he really appreciated the teaching of Greek Mythology in a new, interesting and original way. I mentioned in my first review of The Lightning Thief that I wanted to go back and read D'Aulaires' Book of Greek Myths or maybe Homer’s The Odyssey, but have I? I’m not going to answer that, but I will let you know that I did finish The Titan’s Curse reading it differently. Did I like it? Yes. Was it great? No. Unfortunately, I think Mr. Riordan missed a couple of opportunities to make his work stand above the critics (like me) that his books are subtle knock-offs of another series that “will not be named”. The best example of this is when the di Angelo siblings are introduced as the newest half-bloods in the story. An opportunity to explore these character’s feelings as they learn of their new identities as a daughter and son of a god was lost. I thought it would be interesting to see a different perspective than that of Percy’s, but that was not to be so. This installment is also basically the same as the first – a journey across the United States to save the world from the return of the Titan Kronos. But the true craft that I have finally appreciated is the way Riordan weaves Greek myth into a modern day adventure. The Lightning Thief was the myth of Odysseus, The Sea of Monsters was the myth of Jason & the Argonauts, and now The Titan’s Curse is the myth of Hercules. And not a glossing over of those myths – a full telling with many of the side stories and details of the mythology that I would doubt would be learned in any elementary school or junior high. I lost myself in the adventure and spent less time making comparisons. I am a sucker for young love and the author does a nice job with the awkwardness of it, and I look forward to see how it develops further in the next two books. Knowing his audience, I also appreciated how death and the loss of a loved one were handled in this book. I may have to read something else now and let some anticipation build for The Battle of the Labyrinth. What new Greek myths will I learn next? Reimagining the lives of deceased women authors is literary vogue: Jane Austen and The Brontë sisters have all been recreated in memoir-like fashion, as have the characters from their many novels. Kelly O’Connor McNees has now added The Lost Summer of Louisa May Alcott to the list of “biographical” fiction – and I’m so glad she did. Louisa is the fiercely independent daughter of Bronson and Abigail Alcott – and along with her three sisters, has settled in Walpole, Massachusetts, much against Louisa’s desires. At 22, she is eager to become a writer and to set off on her own in Boston to pursue her dreams. However, because of her father’s ideals and lofty philosophical beliefs (which results in no job and no income) she must stay at home and help her family subsist on virtually nothing. In spite of the meagerness of their lives, Louisa enjoys the friendships of a group of young Walpolians – they entertain themselves with picnics at the swimming hole and producing theatre for the community. One such friend is Joseph Singer, a dashing young store clerk who shares Louisa’s love of poetry and literature. 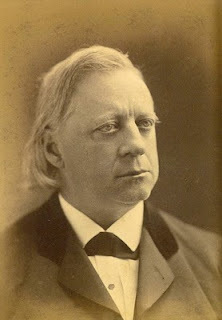 It is clear that Joseph is smitten with Louisa’s verve and intellect, but Louisa is determined that she is above and beyond having a relationship with this suitor. What proceeds, is a wonderful, if not bittersweet love story. I thoroughly enjoyed this book. The character of LMA is exactly how I had her imagined – extremely independent and willing to sacrifice most everything for the sake of her writing (including her romantic/personal happiness). From what little I know of LMA, I thought the author did a skillful job of interweaving fact and fiction – including the use of the known friends of the Alcotts – Emerson and Thoreau. She vividly recreates 19th century rural life, which although harsh, seems very bucolic. She also had a spare, but beautiful prose that reflected the style of LMA. I’m eager to indulge on the writings of LMA after reading this book. And if you are looking for a “summer read” then The Lost Summer of Louisa May Alcott should be on your list! 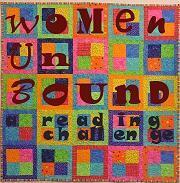 If you are interested in a "reading challenge" Margot at Joyfully Retired is hosting All Things Alcott Challenge. There is still time to participate. Also, not too long ago, PBS produced a fabulous docu-drama on Louisa May Alcott. Here is a snippet, but I highly recommend viewing the entire episode! I finally had a break out book this week -- Ayelet Waldman's Bad Mother. I highly recommend it for a book discussion or for girlfriends who are mothers. She is a brilliant writer, PLUS, there are many potential hot button issues to discuss (or debate, which ever you prefer). So far, this is a delightfully quaint book. Nothing particularly new for this genre, but very enjoyable. Louisa has been a fun character to follow. I think this has been made into a movie -- but I'm not sure if it was ever released. One of my "goodreads" friends finished this in one day, she said it was so good. I want to believe her! I Capture the Castle tells the story of seventeen-year-old Cassandra and her family, who live in not-so-genteel poverty in a ramshackle old English castle. Here she strives, over a six-month period, first in a sixpenny book, then in a shilling book, and, finally, in a splendid two-guinea book, to hone her writing skills. And it is within these pages that she candidly chronicles her encounters with the estate's new, young, and handsome American landlords, the effects of her sister Rose's marital ambitions, her writer's-blocked father's anguished and ultimately renewed creativity, and her own hopeless, first descent into love. For me, I've actually accomplished a lot this week. My PTA duties begin in earnest this week, so I'm not sure July will be as literary prolific as June -- but I'm trying to keep up the pace until school resumes, because I know my reading time will take a hit once I'm fully ensconced as Madame President! Ugh!